Since I got this laptop I’ve been making changes to the system and installing stuffs I need for my work. But from time to time I’m experiencing some system halt maybe because of those changes. When I browse about those problems in the internet I learned that Windows Vista have lots of complaint and seems buggy. One remedy that seems to work every time was reinstalling the system drivers and software, like for example the when I experienced the loss of audio on my laptop. But one incident happened to me when I lost the battery meter icon on the system tray. I’ve search some forums and blogs discussing their problems how to solve this thing but they all seem not to work successfully. I even read a tip on how to solve it by tweaking the registry and deleting some stuffs in there. I don’t want to take that risk so as much as possible I refrain from doing it. Not unless I enjoyed seeing the Blue Screen of Death (BSOD) every time I use my computer. 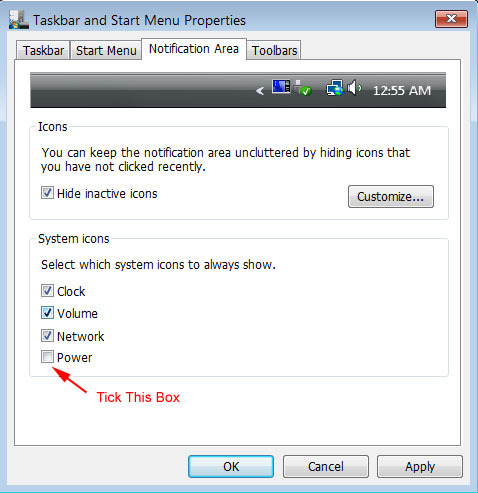 🙂 Another computer troubleshooting tip I read is by enabling the system icon on the Notification Area by pointing your mouse on the system tray (The system tray is located in the Windows Taskbar, usually at the bottom right corner next to the clock) and right clicking it. Then clicking the properties menu bar and going to the Notification Area then tick the check box of the “power” (see Figure 1 below). That is easy if that was your only problem. The tricky part is when that check box is grayed out and you can’t enable it (See Figure 2 below). There were problems like that which seems never resolved based on the troubleshooting tips I read. I was frustrated, but I remember a similar incident like this one which resolved this issue is by going to the “Device Manager”. You can go there by clicking the Start>Control Panel>System and Maintenance>Device Manager. Depending on your laptop brand regarding its location and search for the “Batteries” device (See Figure 3 below). Highlight and right click the “Microsoft- ACPI Compliant Control Method Battery” then proceed to “properties” bar. After you clicked the properties button, you will see the details of that driver. 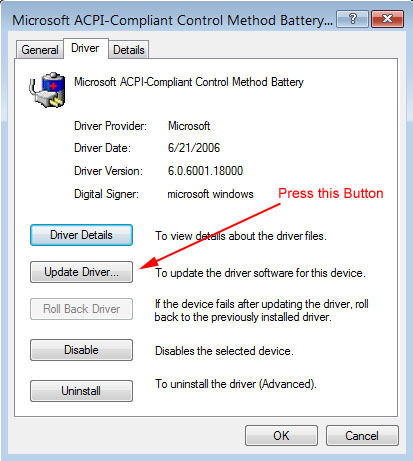 Then proceed to the “Driver” menu button and click the update button to update the driver (See Figure 4 below). 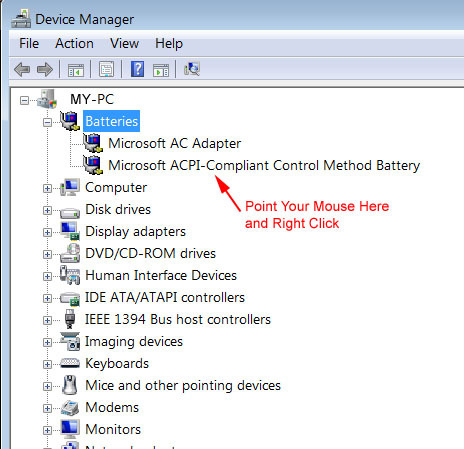 If everything else fails, then the last thing I recommend is to delete the “Microsoft- ACPI Compliant Control Method Battery” device (See Figure 3) and reboot (highlight, right click and delete). It worked for me and hope it will work for you too. 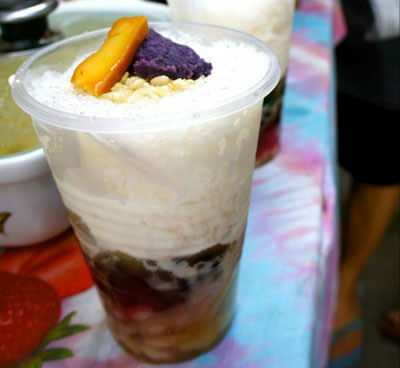 Why am I rambling about the technical stuffs since my niche is about entrepreneurship and home business? Simple. Computers is a an essential tool of an entrepreneur these days and we seemed to be crippled without one. Not everytime an entrepreneur have a technical specialist on his side so this troubleshooting tip could be a great help. And besides, I can’t find a solution myself so I’m just sharing my solution to everybody needing it. Also don’t you think a battery meter is important for a laptop? When you are always on a trip and use battery power most of the time I think it’s important to know how much juice still left to power your laptop. Next: Blogging for Business or Blogging for Money?